Those persons expecting a rapid increase of temperatures may have felt a certain unease during the first 10 years of the 21st century, when the global temperature did not seem to have risen as rapidly as it did in the 80's and 90's in the 20th century. Sometimes a knee-jerk response has been to deny this slow down of the temperature increase, and later, squabble about the sign of the estimated trend and about the cherry-picking of start and end years to calculate this trend. I think a better way is to look at temperature simulated by climate models, not only for the first decade of the 21st century (see for instance, Knight et al 2009 ), but for the whole 21st century and check whether decades with near-zero or even negative 10-year trends are rare or common. Climate simulations show that decades of near zero or even negative global annual trends are not particularly unusual. I have not analyzed all the data from the IPCC simulations in an effort to try and ascribe a significance to a zero temperature trend in the first decade of the 21st century. What I did was to look at some simulations we performed several years ago with the model ECHO-G) for the past millennium, and forwards to AD 2100 under different GHG scenarios. The global annual temperature from one of these simulations is shown below. The upper panel shows the global annual mean temperature between AD 1800 and 2100 simulated with ECHO-G. This model has been used in the IPCC AR4, although this simulation does not belong to the IPCC suite. To drive the model we used an estimation of the historical forcing up to AD 1990 and thereafter the B2 scenario for concentrations of carbon dioxide and methane. Solar irradiance in the 21st century was kept constant at the 1990 level. The temperature increase between AD 1960-1990 mean and AD 2100 is about 2ºC. The temperature increase in the 20th century, about 0.7ºC, is quite reasonable, although this is not a very important point now (I write this just in case someone wanted to argue that the CRU mails put this trend into question). The lower panel displays the gliding 11-year linear trends. For instance, the data point centered on AD 2005 indicates the linear trend calculated with the data in the period AD 2000-2010. It is clear that negative temperature trends are simulated on several occasions: AD 2001, 2018 and as late as 2085. In other simulations with the same model and under the same scenario, the decades with negative decadal trends may occur at different times and more or less frequently. The frequency with which a negative decadal trend appears in the simulation depends on several factors. Without trying to be particularly accurate, one could mention as important factors the rate at which the forcing is increasing, the climate sensitivity, the thermal inertia, and the amplitude of the internal variations at decadal time scales. This latter factor is just the range of variations of decadal trends in a climate without changes in external forcing. Thus, a simulation with a steeper increase of greenhouse gas concentrations may show negative decadal trends less frequently. A climate system with larger internal variations may display negative trends more frequently than a system with smaller decadal internal variations. It can of course be asked on which grounds can we be sure that the internal decadal variability in the model is realistic, and that would be a good question. Under scenario A2, a pretty pessimistic scenario, the model ECHO-G simulates one decade with negative trend at the start of the 21st century. Since the prescribed external forcing in the 21th century increases monotonically, decades with negative temperature trends can only be caused by internal climate variations, unrelated to the forcing. Certainly, by widening the period over which the trend is calculated, for instance from 11 years to 15 years, the internal variations tend to be filtered out more strongly and the frequency of negative trends should diminish. How long should the present period with near-zero or even negative trend be in order to claim that models are incompatible with observations? This question requires a much more detailed analysis of a large ensemble of simulations driven by the observed forcing, including concentration of greenhouse gases, volcanism, solar irradiance and others. However, from this quick calculation, it seems that 10 years is just a bit too early to feel lonely .. or exultant. At what point do you think would a flat or even negative trend invalidate some, most or all climate models or predictions? The link to the Met Office PDF has an extraneous ')' at the end. What is your "betting Bayesian" response to the first commenter's question? I mean, taking into account not just this simulation but it along with all your impressions (imperfect as they are) of how the climate system operates, what sort of departure would make you question what sort of AGW claims? I think some like Lucia have been dense and or sophistic in their discussion of the stalled temp increases. I also think Tamino has been rather bone-headed in his discussions as well. When he denies simple statements like the temps are stalled for last 10 years, its like he doesn't even want to give a sound bite and is just reacting viscerally to debate without an ability to engage. I am COMPLETELY comfortable with the statement that the stall may not be SIGNIFICANT. But that is different from even being able to literally say, yes it happened. I mean I can watch a run of reds on the roulette wheel at Vegas and just say "yes there weas a run" without in any way agreeing that it is significant. And against my little "not playing fair denialist friends", I level the charge that they advance two kvetches which cut against each other! First they wax on about "long term persistance" (essentially a kvetch saying the climate systems are capable of very long excursions on their own, not easily detected as AR1 or simpler processes, such as perhaps even the entire 20th century excursion. Then second they try to make a 10 year stall as significant! Which one is it! Reminds me of McIntyre throwing theory after theory like mud against the wall to see what would stick in terms of explaining BCP growth (it's precip, it's sheepgrazing, it's dry lake beds blowing, it's CO2 fertilization, it's selective reporting, etc. etc.) At a certain point, you no longer get the impression that the debator (McI) is even trying to understand the phenomenon...but just looking for ANYTHING other than AGW itself to be an explanation. IOW, he is a sophist and biased. Not an honest broker. If I were hard-pressed to mention a subjective number,and provided that no other important forcings come into play, such as a big volcanic eruption or a sudden big drop in solar irradiance, I would consider 15 years as a sign of a serious problem with climate models. Either they would overestimate the sensitivity or underestimate internal decadal variations. Fair enough, Eduardo. That's something alarmists don't say, as far as I know. And is something Roger Pielke Sr. has been asking for a long time. And I don't see the "consensus" working on it, as they should. Wouldn't it be great to know some reasonable conditions of falsation of the models? Is it too unreasonable asking for it? from the model you picked (or others as well) it would be interesting to know what exactly 'natural variation' means with respect to energy budget or dissipation in times of stagnation or decrease of global temperature. Is there a common pattern we might look after in the real world? there are already some predictions on the table. The Hadley Centre has predicted that half of the years in this decade will be warmer than 1998.
to answer your question requires a whole research paper, and I am not aware of any yet. I guess there will be some about this soon. Could be the same time frame as yours. It looks quite possible not having any of the next five -six years warmer than 98.
your responsiveness is very appreciated. But given you're an well informed expert in the field that would mean that at present explanations involving mere 'natural variability' are not really based upon scientific understanding? Knight et al (see Eduardo's link) also suggest that climate models typical of those used by the IPCC would have questions to answer if there were a 15 year zero temperature anomaly. I was thinking of writing something longer related to this. Then we would see that climate models have deficiencies. Actually, it is known already now that they are not perfect. But think of economics. Are economic models perfect? do they all produce the same forecast for economic growth for next year?. Can they predict unemployment in 5 years time? Are they validated in independent forecasts? Clearly not, but still they are used and considered for economic planning. I see your point, but perhaps you can see also mine. there are certainly large gaps in the understanding of internal variability, in particular at decadal and longer timescales. However, as TCO very pointedly indicated, this applies to the argument that the 20th century warming could be due to just internal variability. One would need very persistent internal variations to explain the warming in the 80's and 90's. Which would be the mechanisms for those? The 'external forcing' explanation, GHG plus may be less atmospheric aerosol (global brightening) seems more straightforward. Not sure. We have a theory saying CO2 will warm the climate system. Sounds sensible, or not so much -that's the discussion. Its seems whenever you ask for evidence, it all ends in the models. Do they work? If not. I can't find a reason not to discard them. I mean to discard them not as scientific tools, but as policy makers. Of course they might be only partially right. Say, instead of 3 - 6 degrees warming, only around 1. Plus the "out of LIA" thing, 1,5. But that's a very different problem, isn't it? Maybe even a no problem. And about the economic models, I can't imagine any democratic goverment proposing a general impoverishment, based on the recommendation of an untrusted economic fancy model. I don't think economists are so popular as forecasters. Alright Eduardo. Models produce periods of warming stagnation. But the thing is that, based on those models and, I assume, taking into consideration this feature inside them, the IPCC chose to make quantitative predictions for the fist decades of this century in a chapter aptly titled “Understanding near-term climate change”. A value of +0.2C/decade was forecast for the first 30 years (half of it due to the “commited warming”). Should we treat this as a scientific (and thus falsifiable) prediction? If not, how is one to distinguish between scientific and non-scientific predictions in the IPCC literature? Contrary to those who deny the stasis or squable about the trend, your position apeears to be “let´s wait another five years”. While I appreciate the fact that there may be good reasons to only be able to extract a climatic s ginal in a 15 year period, I think that we can already conclude that the IPCC prediction will not materialize and the models are thus in trouble. We´re not going to experience a warming of 0.3C in the coming 5 years, are we? Precisely. Nobody would take a 100 year, 1-variable economic forecast very seriously. Perhaps the chaotic nature of a system composed by humans and institutions taking economic decisions is not so different from the turbulent atmospheric system? And that doesn't even take into account the gross incompetence/fraud involved in the datasets. You guys trust the temperature record? The temperature record that shows numerous, and quite significant downward revisions of early 20th C temperatures. That doesn't appear to have been properly adjusted for delta UHI effects? Where the number of temperature stations used has dropped dramatically. Where the stations dropped are likely those that don't show warming. All this implied/revealed by the CRU e:mails. Sorry. I don't believe the climate scientists on this issue. It seems likely that the increased Global Mean Temperature since 1900 or so cannot be relied upon. Numerous studies show that the 'adjustments' and lack of allowance for delta UHI account for a large part of the claimed warming. The real answer would appear to be that we just do not really know. I've observed some shift in the argumentation line - or so it seems. When we had the warming expected by the models it was based upon physics. Now since we're a bit off track, the argumentation becomes more of stochastic nature. This comes a bit as a surprise to me. If the models do show this behaviour as well then probing them for a physical explanation seems a very straightforward and obvious thing to do. Hard to believe it hasn't been done already. As for your thoughts: I wouldn't dare to simply offer 'long term persistence' as a silver bullet. I do not have one. Economist are indeed not very popular these days. This does not prevent the US governement to spend something like $1 trillion in a stimulus package, although the consequences of that stimulus are quite uncertain. Probaly all economic models would indicate an improvement in GDP, although they disagree on excactly how much. I recall I had posted a comment on Climate Feedback on a text by Trenberth that is related to what we are discussing. It seems that we haven't moved much in the past couple of years. You asked me what I would think if we had no warming in the next 5 years, and I said that I would think that models would get into trouble. if we see a warming of .3 K in the next decade, would you think that perhaps the AGW theory may be correct? if not, what is the warming we should see for you to start considering that AGW is correct? Or is this number infinite? if we see a warming of .3 K in the next decade, would you think that perhaps the AGW theory may be correct? I allready think AGW theory may be correct. But, how much AGW? With 0,3 K in the next decade, it would be 0.17 K in 40 years. Not very good for the models, not at all "worse than we thought", but no nonsense by any meanings. That's a political option, not established science. Nor is it a forecast / prediction /projecton many decades away. I was meaning 0.17 K / decade in 40 years. Eduardo: I'm afraid the IPCC short-term prediction is indeed not easy to interpret. One could for example arrive at 0.6C in 30 years by having zero warming in the first 2 decades and then 0.6C in the third one. However, to my non-expert eyes this wouldn't look like a good validation of the predicted warming of ‘about 0.2C/decade for 3 decades’. In this respect, if one is to wait 15 years to asses the prediction, some 0.3C of warming should be evident by then, which is harder and harder to get at while you approach the 15 year limit with ~0C warming. Hope this makes sense. As for your question, if the IPCC prediction holds (as James Annan or Gavin Schmidt seem to think) a warming of 0.3C in the next decade would surely be quite impressive but one would still have to wait another decade and see if that unprecedented warming rate holds. As plazamoyua says, AGW theory *is* correct (CO2 does indeed block infrared radiation). What we’re all interested in is its magnitude. Just my opinion. wolfgang, @20: Given Hasselmann's Stochastic Climate Model approach, I felt always a bit uneasy about the success of the GCMs to reproduce so well the temperature record of the 20th century. I felt there whould be more free (unexplained) variability (due to the integration of the ubiquituous presence of short term variability), at least in individual simulations - but the numerical experiments indicate that the external forcings would really dominate all multi-decadal and longer term variability. Eduardo's little exercise with ECHO-G show more of what I would expect. But my expectation may be wrong. Anonymous, @19 - You are touching upon an issue, which we have not yet discussed on the Zwiebel - namely the issue of data homogeneity, and the need for "corrections" to make data comparable across time and space. This is a tricky, most significant issue, which yields little publicity for the practitioner. Likely the issue of data homogenization has hardly been conveyed to the public, and we here at the Zwiebel should do so in some future. I think we may take a look to the problem of the models from another perspective. Climate system is very complex. There is radiation going up and down in differente wavelengths and with different processes acting. The diabatic heating by means of radiation means that the vertical structure of temperature changes. While doing so, we have to open an eye and look for the potential existence of static instability. Diabatic heating is not spatially uniform, and, geopotential gradients drive wind. Wind transports moisture (amongst other things). Wind stress over the oceans produce surface currents and there are momentum, energy and moisture exchanges between the ocean and the atmosphere. Precipitation and cryosphere thickening is another process which couples the atmosphere and the cryosphere. There are some simple and fascinating analytical solutions (Eady's baroclinic waves, Held-Hou and Hadley cells, or the Stommel's theory of WBC intensification). However, these simple solutions can not be applied to complex problems (oceans are not rectangular and winds over the oceans are not strictly zonal). I can not think of anybody considering at the same time the horizontally anisotropous vertical structure of temperature, the changes in temperature due to energy fluxes, .... on the back of the envelope. Models are not perfect, but they are the only tool we have. If we reject models we are left with nothing. This does preclude that models should be made better year after year and a lot of work is being done on this direction. But, for me, the choice is clear. Models or proceed blindly. I could not find a comment from Trenberth to your falsification challenge. Did he reply? If I understood you correctly, you think AGW theory may be right, just the magnitude of the warming is very uncertain. I would rephrase my question then. How large should the warming in the next decade be for you to think that we should limit GHG emissions immediately? Would it be enough if the Hadley Centre prediction (half of the years warmer than 1998) turns out to be correct? We can pose a similar question to AGW advocates. how negative should the trend in the next decade be to make you think that something is essentially wrong with climate models? I think this is a healthy exercise for each of us. To check ourselves if we are interested in the truth or advocates. limiting GHG emisssions is a political option as well, not a scientific one, and one that is framed by scientific uncertainties. If you accept AGW is happening and that decadal zero anomalies do not represent a serious problem for IPCC climate models, then how else other than those models can future warming be estimated? Without them the rate of warming is anyone's guess - unless I am missing something. Either we give the models a chance or cross our fingers and pray. If you accept AGW is happening but consider that decadal zero anomalies are a serious problem for climate models, then how do you interpret zero anomalies? Surely another zero decade would ring the death knell for AGM, barring some hitherto unknown factor being identified. That should have been AGW. Leigh, some level of AGW must be happening because of basic physics. This was foreseen in the 19th century. But to this date we can't say based on empirical evidence whether the effect is trivial or worth worrying about (if anything, observations seem to support the former scenario). I do think that one decade of no warming puts the IPCC models in trouble if we simply apply the scientific method. But I was thinkig that Eduardo would help me understand this better if I'm wrong. I think it may be right, but I also think it may very well be wrong. With negative feedbacks. Even with no feedbacks, or with very small ones, it would be a right theory, but a no problem. How large should the warming be to accept there is a big problem, and not just nature? I don't know, I am not the expert. I will listen to the experts and their arguments, and as many kind of experts as possible. That's what I am doing. You may say 0.3 K in the next decade is evidence enough. I'll listen what others say, and I may be convinced by you, or not. Experts with "tricks", "hide the decline", "settled science", and so on, don't have a big chance to convince me. I don't trust activists. And that's why I really apreciate what you are doing in this blog. Let's leave the economical think apart. It's apples to oranges. The financial crisis was not an hypothesis, nor was it a forecast / projection / prediction many decades ahead. A decision was needed, and one was chosen. Not everybody agreed, but that's the usual way. While interesting, this debate neglects two important aspects which need addressing. First, regional temperature changes as opposed to global changes. Even if we get a global zero trend, there may be important changes on a regional level. Second, other anthropogenic climate forcings than GHGs (e.g. land use patterns, aerosols). Roger Pielke Sr. (with many others) has just published a paper on this. resources several decades into the future. But Reiner, regional temperature changes with a zero global trend would not be a CO2 problem, would it? As for other human forcings, you are right. But nobody is going to look at it until the CO2 nightmare ends. The models passing this reality test later will fail in precipitation or cloud cover, sea ice, climate sensitivity ... you name it. That's probably why their results are preferably presented as relative changes and anomalies. So to answer Eduardo's question I'd think we could expect another +1K per century ... and if it turns out to be +0.3K the next decade alone I would not be completely convinced but I would be much more concerned - say 50:50 I possibly got that wrong? 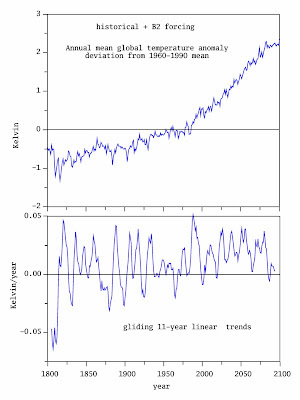 As for your paper you mentioned: It says that given the temperature signal of the past was nothing but pure white noise (iid signal) fed into an AR1 time series model it would most probably not have generated a distinct number of temperature extremes observed in a certain period of time according to a popular global temperature reconstruction that came under some investigative pressure lately. Now I should be more/less convinced of what? What is the evidence that AGW to date is trivial? If it is true that AGW has so far been trivial,is it reasonable to suppose that it will remain trivial in the future? Put shortly, that 2.7 W/m2 GHG forcing has only been followed by a 0.7C warming, not all of it attributable to GHGs. Yes, especially considering that models seem to be biased high. Perhaps due to the important tropospheric aerosols factor that Eduado himself mentioned in his Nature blog post. This latest revision by Myhre would shift the sensitivity to slightly lower values. I didnt say that the sensitivity of models is biased high. how should I know? Hans brings to our attention the paper "How unusual is the recent series of warm years". I read it when it was published. I thought then that the question posed at the beginning of the article was quite clever. I was quite impressed when reading the small probability (0.1%) of the high temperatures happening just by "chance". But this feeling was only until I read a detailed analysis of the paper by Lubos Motl (see http://motls.blogspot.com/2009/01/record-breaking-years-in-autocorrelated.html). I am fully convinced by Motl's analysis. I expected then some response from you guys, since the difference in the calculations between you and Motl is almost two order of magnitude. While 0.1% is negligible a ~ 10% it is not. This is the type of discrepancies that leaves interested people truly amazed. Some people says 1 while some other people says 100, and in the meantime the IPCC says the science is well settled ( sounding like a preposterous message because it's a preposterous message). With this type of actual scientific discrepancies (100 to 1) there is some other people wanting to dictate worldwide politics. Once for all let's agree that is preposterous too. I didnt say that the sensitivity of models is biased high. No, you didn’t. I did. Yes, I know. But we can be rather certain about the figures I am using (Climategate notwithstanding). However, the aerosol figures that bring the net forcing dramatically down are, as you said, a bit ad-hoc. Or as the IPCC says, the level of scientific understanding about them is low. 1) If the mid-century cooling had been caused by these aerosols, the effect would be much stronger in the NH. However, HadCRUT shows a steeper cooling in the SH. 2) We should be able to see a regional cooling over the emitting areas and downwind from them that would offset the warming elsewhere. Nothing of the like appears in the instrumental record. China and India don’t show any big signs of cooling. But, in all likelihood, I must be missing something. If someone could point me to a paper explaining the above issues, I’d be most grateful. I interchanged some mails with Lubos at that time, who also seems fully convinced of his approach. Well, I am not. This would be a bit OT, but I recall that his model could not replicate the observed autocorrelation function. Anyway, we cannot respond to all blogs. Lubos is a physicist that has published in scientific journals in other areas. He can also publish his findings in a formal climate journal as well. We have never tried to scupper paper from critics, quite the contrary. Then we would respond. IPCC AR4 has the net estimate of anthropogenic forcing at 1.6 W/m2 with 0.6 to 2.4 W/m2 90% confidence range. Given the relatively low understanding of forcing effect of aerosols compared with GHGs, particularly on cloud albedo, if the value of 2.4 W/m2 or higher is considered to be trivial, how sould we describe positive values of 0.6 W/m2 or lower? The IPCCC evidence is equally supportive of both scenarios. You have a point with the aerosols, at least partially. The IPCC states that the level of understanding is low. If you look at the upper panel of the link above, you will see that the indirect effect of aerosols (= the role of aerosols as cloud condensation nuclei and their effect on cloud lifetime) may be even more important than the direct effect. The indirect effect is much more difficult to quantify and locate, and hampers a narrow estimation of climate sensitivity. Yes, there are uncertainties, some of them large. But this does not justify, at least in my opinion, to say that everything is wrong. To hide the uncertainties is wrong. Motl is a string theorist. Those people are like a bunch of evil Mike Mann's. A god-fearing solid state experimentalist should have nothing to do with one of these dabblers who is not even wrong. I understand you cannot devote your time to a time consuming task like responding to doubts arising in weblogs. In fact that this is what I consider like "business as usual". But debate on climate jumped to general public long time ago, as a matter of fact let me emphasize you've got your own weblog. So can we still say this is business as usual?. I think it's natural from everybody a demand for all available channels (as long as they are polite and well informed) since this area of science is not "business as usual" due to a variety of reasons we all know. Reading the mails you interchanged on the subject would be a pleasure. Thanks for your prompt response. To your question: The greenhouse theory as such is not in question even with another 20 years of no warming, simply since the most probable reason of mismatch then is not the IR radiative transport of GHGs but that we would have underestimated other factors. To my opinion the models would need a serious and fundamental check if the warming is going on in the next 5-10 years. I think that is pretty straightforward statistics. I think that a blog is not the optimal way of disentangle scientific/technical discrepancies. It leads to an endless exchange of postings that perhaps may be hurriedly written. A paper, by contrast, forces the author to focus on a problem during several weeks, weighing many possibilities of errors and rechecking her/his results . Furthermore, usually reviewers have insightful comments. Just to satisfy your curiosity here is an example of the email exchange with Lubos at that time, about 4 or 5 mails. As I said I am not going to engage again on that matter. As you can see the problem was that we didnt get the same result in a simple calculation of the autocorrelation function of the global annual mean temperature, which has been published in many other papers. 2 525 KB Image, ""
calculation of the autocorrelation function. as it often happens, it depends of the meaning of the expression 'the AGW theory'. As I tried to explain, I think the probability of periods of no warming depends on the following factors: the rate of increase of the forcing, the sensitivity, the termal inertia and the amplitude of 'internal variations'- perhaps I am missing still a few more,and I am not considering here volcanic eruptions and similar. All, with perhaps the exception of the thermal inertia, are uncertain, so that the longer this period lasts, the estimation of these factors shifts towards a certain range, for instance towards smaller sensitivity. At some point, some of the models will not be compatible with observations any more because their sensitivity would be too large or their internal variability too small. I dont see it as a matter of proving or disproving a theory, which is not very accurate in its predictions anyway, but of disregarding some of the models. might be I am too much discussing with complete nutters.Sorry. With 'the greenhouse theory' I refer to just the fact that GHGs change the energy balance of the surface of a planet and more/less of these gases will change it more/less. I know that's very trivial. This (very basic) greenhouse theory will not change even if there are decades more of no warming (however even there is a limit. If 300ppm more in the air do not have any observable impact on temperatures then we would have to look on the radiative transfer equations again of course), however the importance of other factors you were mentioning might change. The IPCC gives the highest rate of understanding to the action of GHGs however much lower rates for e.g. to the action of aerosols etc. If there were no warming for another decade we would rather look into these parts of the puzzle than into what I called the "basic greenhouse theory". (see Hansen's paper on Target atmospheric CO2, 2008) which are all not included in modern state of the art climate models. Points is it can be that we (certainly we, both of us, in our lifetime) never really know what is the "real" climate sensitivity and which model is "wrong" and which is "right". But that might be a too pessimistic perspective. A constraint of climate sensitivity into a range of ±0.5C might be allready very satisfying and I dont know how many of the existing models that would actually qualify as wrong.